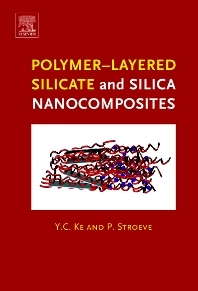 Polymer-Layered Silicate and Silica Nanocomposites includes advanced materials and nanocomposites based on silica and layered silicates obtained from resources in China. Using nanotechnology, these inorganic materials can be filled, in-situ polymerised and combined with polymers with nanoscale dispersions. In this book, many practical examples are presented to show how to prepare the nanocomposites. Several kinds of polymer (PET,PBT,PE,PP,etc. )-layered silicate and silica nanocomposites are prepared and investigated based on our research works, inventions and applications. They are prepared and modified aiming at their applications to such fields as, functional films, barrier materials, coatings, and engineering plastics. Their structure-property relationship, especially the nano effects from them are investigated under different techniques to show how the critical load of the inorganic phase has the effect on the final properties of the nanocomposite materials. Obviously, this new generation of materials has revolutionary effects on the traditional materials or industry as petroleum. Some of the prospects of them are thus included.